With the amount of reservations that move through hotels every year, there is a wealth of data available to the hotelier who is willing to put the time into analyzing it. With the powerful reporting tools available through a hotel’s distribution channels, PMS and booking engine, it’s easy to spot booking trends and begin rate forecasting. But what about the data that walks out the door after each check out? Every guest that stays at a hotel has a wealth of knowledge that only a fraction of them are willing to share, and when they do it typically comes in the form of a review. TripAdvisor and Yelp have some analytical tools to track these reviews, but they are limited to what they ask or stuck behind additional pay walls. So what can hoteliers do to collect more of this data and use it to improve their hotel and the guest experience? It’s actually fairly simple, start conducting guest surveys after checkout. Simple surveys can be made using many free tools like SurveyMonkey. All of these have a variety of analytical tools that can really help identify trends, weak spots and opportunities available to the hotelier. 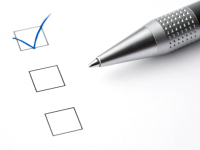 Effective surveys are going to be quick with short and specific questions. So when developing the questions, target specific areas of the hotel that are of interest. Focus on Check In/Out Service, Housekeeping, or any other specific amenity the hotel may feature. The hard part is actually getting the guest to take the surveys. Traditional techniques have been including links to the surveys in post stay emails, but that is just the start. A kiosk using an inexpensive computer or tablet can be set up in the lobby encouraging guests to leave their comments. For the guests that are in a rush and cannot stop to fill out the survey in the lobby can use a QR code to scan and take the survey on their phone on the way to the airport. Like any anonymous review or feedback system there will always be the risk of fraudulent submissions. To help combat this ask for a unique identifier from their reservation, like an email address or even their reservation number. This can help to sort the data later to the real information and leave out any erroneous entries. But even the best survey still needs to be taken to be effective, and getting guests to leave reviews online is difficult enough, so incentivizing the process may be necessary. The go to method here is to offer a discount on a future stay, but depending on the type of traveler they may not have their next trip or vacation planned so they may not see the value in this type of incentive. Alternatively, a hotel could offer a discount on the departing reservation once the survey has been completed. Depending on rates and turn costs, 10% off a single night stay can be a very attractive to the guests, without drastically impacting the hotel’s revenue. The data that these surveys can collect can be extremely valuable if used properly. Any set up costs and discounts that may have been offered will be easily offset by the potential boost in occupancy and revenue that can come from improving neglected areas and service highlighted in these surveys.